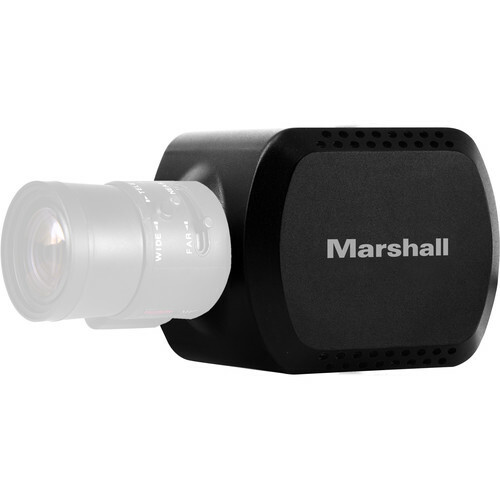 The CV380-CS 4K 8.5MP 6G-SDI & HDMI CS/C-Mount Compact Camera from Marshall Electronics captures up to DCI 4K resolution video at 30 fps and offers simultaneous 6G/3G/HD-SDI and HDMI output. Featuring a compact form factor, the CV380-CS is designed as a discrete solution for broadcast, house of worship, live event, courtroom, remote learning, and other applications. A CS/C lens mount and 4-pin auto iris connector provide support for a wide variety of DC auto iris varifocal and fixed focal length lenses. The camera can be adjusted and matched to other cameras remotely via an RS-485 connection offered on an included breakout cable, or using an OSD menu joystick integrated on the same cable. Image adjustments can be made to white balance, gain, tone level (red/blue), pedestal (blacks), exposure, gamma, and other factors. The camera is mountable via a universal 1/4"-20 threaded mounting hole on the bottom. Box Dimensions (LxWxH) 9.85 x 5.75 x 4.15"